The special cover available only to those that ordered from an online retailer. 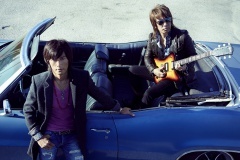 The shot uploaded to the official B'z website during the "Uchouten" promotions and distributed to various press outlets for announcements therein. The newspaper spread featured in various morning editions across Japan on December 3, 2014. The advert named not only the single but also the ensuing album EPIC DAY and the tour to follow. The two B2 size promotional posters available to those that pre-ordered the single in-stores. An early shot of the display at Tower Records in Shibuya, Tokyo leading up to the release of the single. Uchouten (有頂天, Ecstasy) is the fifty-first single by B'z, released on January 14, 2015. It is their first since 2012's "GO FOR IT, BABY -Kioku no Sanmyaku-", ending the longest interval between singles in their career. The title song appeared on their 2015 studio album entitled EPIC DAY and was featured during the ensuing tour B'z LIVE-GYM 2015 -EPIC NIGHT-. 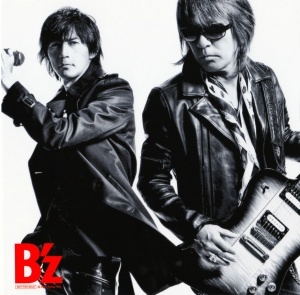 The B-side "Endless Summer" made its studio debut on the release after having been premiered live during the latter half of B'z LIVE-GYM Pleasure 2013 -ENDLESS SUMMER-. The song and release were first revealed in a newspaper advert that ran all over Japan on December 3, 2014. 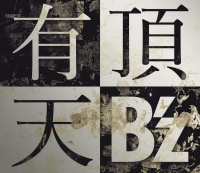 The night before, a popup on the official B'z website first teased the song. 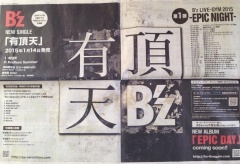 The reveal brought word that half of the show from 2013's B'z Special LIVE at EX THEATER ROPPONGI would be featured as a bonus DVD on the single's limited edition, thus making this release the first to premiere any footage from the event. Songs included in the performance ranged from rarities "Yasei no ENERGY", which had previously not been performed since 2003, to ACTION staples "Kuroi Seishun" and "ONE ON ONE", and rarely-performed single "BANZAI". Most notably, the 1994 album song "Yami no Ame" from the double-album The 7th Blues makes its home video debut here. Additionally, those that purchased the single in stores would be given a choice between two different B2 size posters while supplies lasted, while those that pre-ordered online would receive a single complete with a special cover. To mark their return, B'z made several appearances on television to promote the release at the end of 2014 and early in 2015. This included showings on both Music Station SUPER LIVE 2015 and a year-end CDTV special during which "Uchouten" was their only song performed. For the January 18, 2015 appearance on LIVE MONSTER, B'z performed not only the title song from the single but also paired it with 2009's hit "Ichibu to Zenbu". This would be the most involved of the promotions for the single, featuring a full half-hour episode of the show dedicated to the band, including a sit-down interview alongside the performances. The title song was featured as the theme to the NTV drama series Gakkou no Kaidan (The School's Staircase), making this the first drama tie-in promotion for a single since 2009's "Ichibu to Zenbu". A short music video was premiered on the Yahoo! GYAO web service one week prior to release, featuring the band playing against a stylized, multi-colored futuristic backdrop complete with computer-generated elements. On the day of release, the same version of the video was released as "Uchouten -short ver.-" to music channels in Japan, with the full version premiering on January 19. The single released at the top of the Weekly Oricon Singles chart, becoming the forty-seventh consecutive for the band to do so. In its first day of release, "Uchouten" generated over 75,000 physical copies sold and would garner over 130,000 in its first week. The single ultimately sold enough to be ranked second for the month of January 2015. The band's first single in nearly three years, "Uchouten" is a hard rock song designed to work well in a live setting with several call-and-response moments, priming it as a crowd pleaser. Koshi described it in the band's 2015 New Year's message as the "first new explosion of B'z sound in a long while" due to the hiatus between releases. The composition includes a bass solo prior to the guitar's and sports an arrangement that utilizes both solo guitar and full band instrumentation at alternating intervals. On the lyrics front, Koshi mentioned in a press release for Gakkou no Kaidan—a school-centric drama series for which the song served as a theme—that he focused on the themes of "confidence and insecurity, happiness and sadness" and added, "This song is about cheering oneself up and trying to move on, while embracing these two conflicting feelings." The titular song from the band's 25th anniversary tour B'z LIVE-GYM Pleasure 2013 -ENDLESS SUMMER-, on which it served as the opener for the dome leg of the tour. While it could be heard in live form on the ensuing home video release, its inclusion here marks its studio debut. The lyrics to the song remain the same as the live version heard during the aforementioned tour, but the arrangement and some aspects offer some notable differences. Most predominantly, the guitar intro is more pronounced and of greater length, along with added depth via backing instrumentation in the chorus. Also performed earlier in 2013. Home video debut. First performance since 1994. This page was last modified on 3 June 2018, at 21:29.